This is the third book to result from a research project on community economic development carried out by the Centre for Community Enterprise (CCE) and l’Institut de formation en développement économique communautaire (IFDEC), under funding from National Welfare Grants, Health and Welfare Canada. The project explored the relations between social and economic goals as they appeared in CED projects and programs of urban Canada. Initial research on five of the ten cases presented in this book (ACEM, A-Way, Homes First, RESO, and WECV) was carried out by Jean-Marc Fontan. The authors express their gratitude for his early work and for discussions with him. Further research was done by Stewart Perry on those cases and on the five others. Chapters 1-11 were written by Perry, and chapters 12-13 by Mike Lewis, but both authors provided ideas and critiques for the other’s work. Practical yet comprehensive in orientation, rooted in practice yet at the same time providing a critical link to key policy issues, this book has struck many practitioners as 'the best book on Canadian CED they have read.' 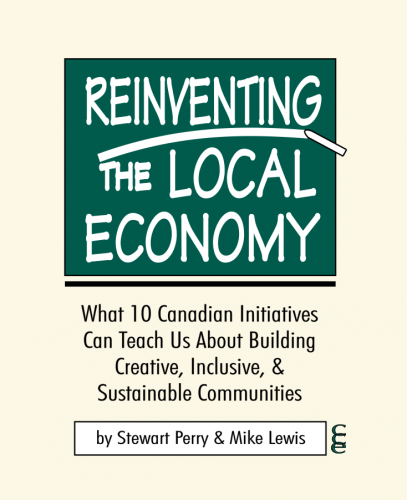 A detailed examination of 10 Canadian development initiatives, ranging from Cape Breton to Vancouver, reflects experience in a variety of sectors: credit unions, labour, the co-ops, government, and an array of community organizations committed to fighting poverty through CED. A summary analysis presses for the policy changes required to foster further initiatives of this nature. Instructive and inspiring reading for students, teachers, practitioners, and policy-makers.